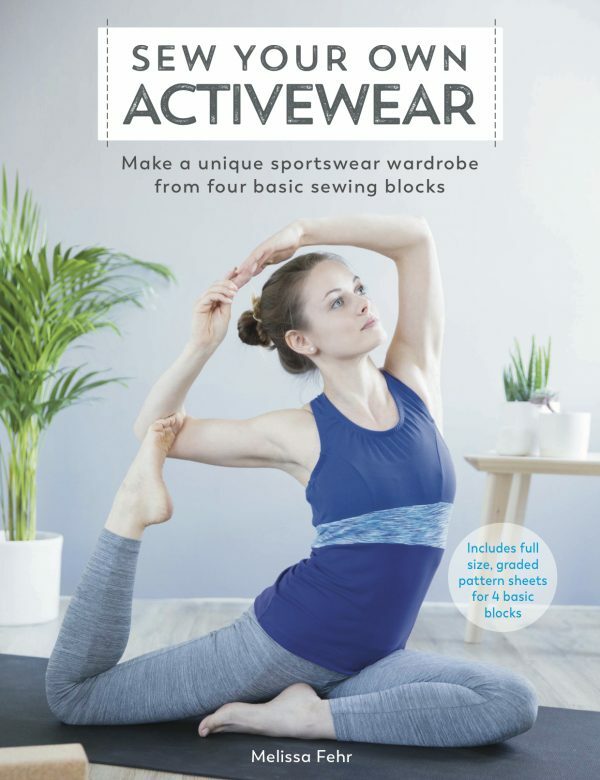 Way back when I was making my first muslins of my new running gear, I realised that the methods I’d previously used to finish knit necklines (elastic, FOE, serged bindings, etc) were just NOT going to cut it on slippery exercise lycra. The results were awful and sloppy, so I allowed myself to be convinced by Pattern Review that a coverstitch binder was the way forward. 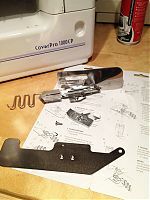 Unlike a lot of the eBay binders, this comes with everything you need to get started – the big metal plate, the shorter foot, and a big set of instructions on top of the binder attachment itself. So it’s expensive, but you don’t need to then go and buy all the non-optional bits separately – but I can understand the allure of just buying the binder for your second or third if you’ve already got the plate, foot, and instructions! But my first several attempts to bind my test lycra strips were just laughably awful, so after fiddling with my tension and foot pressure, I turned to the internet for advice. I’m not sure whether it’s because not many of us own coverstitch machines (I fully admit that mine was a luxury purchase, bought just before I went into hospital), and even fewer of us own binders, but there is precious little information out there. So I decided, after going through about 50 feet of test binding and finally getting good enough results to finish my sequin running vest, that I should do the sewing public a service and compile a bunch of useful coverstitch binder tips all together into one place. I’ve bolded the ones here I’ve found to be particularly helpful. 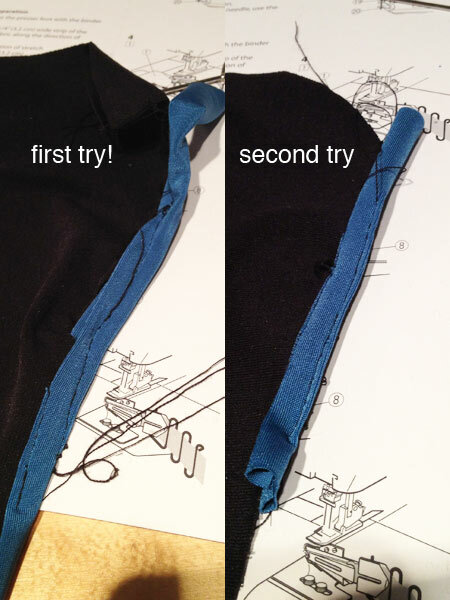 When you go to serge/overlock the last seam, make sure to press (or even hammer!) the two bound edges really flat before serging. Or hand baste the two edges together so they don’t shift as you serge. If your fabric is really prone to curling, try spray starch, or dunking the whole binding in a corn starch/water solution and ironing dry. Either of these are, of course, for clothes you’re planning to wash before wearing! To practise using your binder try using a cotton fabric and cotton binding. Knits naturally stretch when sewing – even when cut with a rotary cutter a strip of knit will shrink after it’s cut and measure slightly less. You need a special binding foot. 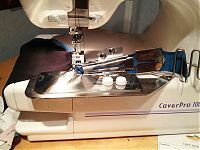 The binding needs to be delivered as close as possible to the needles to ensure nothing escapes and slips away. You can run elastic through while you bind if you wish. You need to use the smooth white/black rubber “swimwear” elastic. It will be powdered to run through your binder easier. I use 8 – 9mm width elastic for a 10mm finish bind. I usually end up with snow white hands. 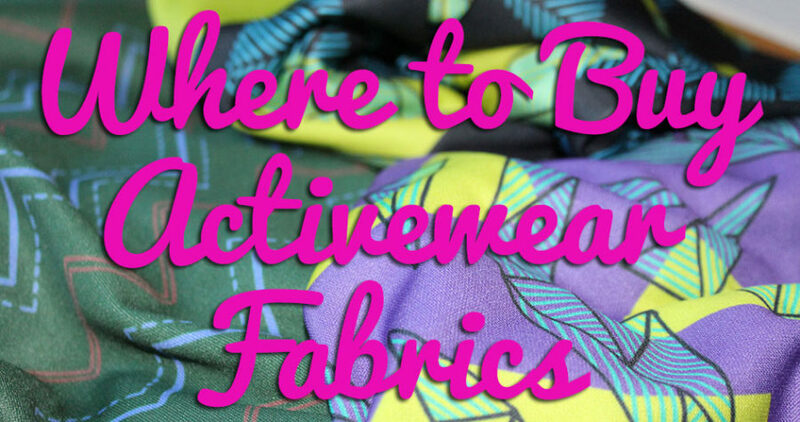 If you are dealing with a 4-way stretch fabric esp. 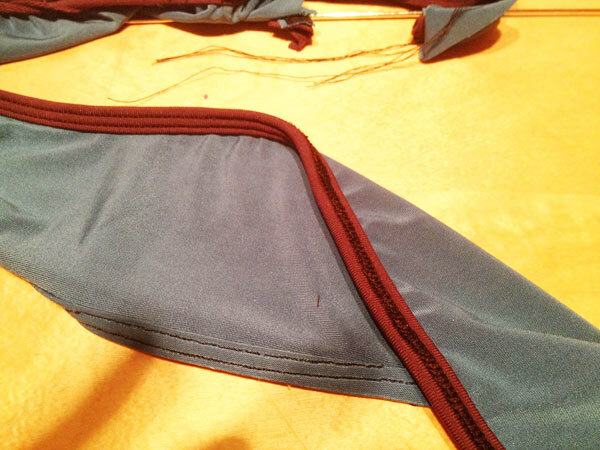 fabric containing lycra, binding cut on the cross wise grain will NOT EVER behave itself. Use lengthwise grain to cut you binding. I use a “single fold” binder rather than a double fold. Less bulk. You might like to try woolly nylon in the looper for a softer finish. The binder must be mounted firmly because you need to apply tension to the binding as it goes through (this will depend on your fabric of course). If it gets knocked your alignment can be ruined. The real breakthrough for me came really when I started experimenting with different fabrics as the binding. The “silk touch” lycra I had been using was sliding all over the place, with skipped stitches and loopy undersides as well, but I found that if I applied a lightweight knit fusible to the same binding fabric, there was now enough “grab” on the underside to really hold the slippery lycra neckline in place. Likewise, the (un-interfaced) Suziplex supplex also worked really well as binding fabric, as it’s got a slightly loopy/brushed texture on the underside. Cut the binding strips just before you use them…don’t leave them lying around overnight as they can curl up. Skye on PR even had her husband create a little spool for the binding fabric to rest on, and I can definitely see the advantage, as you really do need to keep an eye on the binding otherwise to ensure it’s not twisting or bunching on its way in. Finished binding on my sequin running vest! 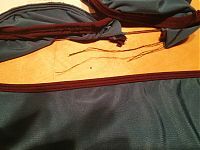 I think my main lesson learnt is that the binder fabric has to have at least some “grabbiness”. I was trying with slippery lycra first and getting awful results. Once I lightly interfaced that, or switched to fabric with a bit of texture on the underside, it went much easier. Also, taking a few stitches on just the binding before trying to insert the body fabric helped, too! 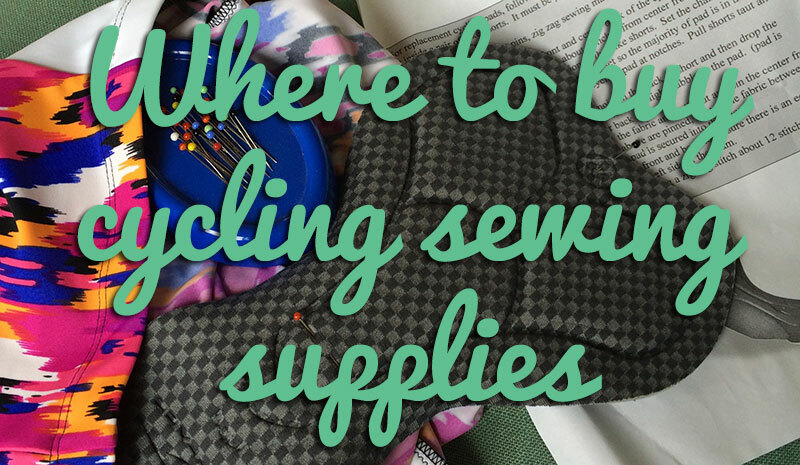 And when you absolutely can’t avoid having a seam in your binding, then you need to go slowly, do a lot of coaxing with the tweezers, and hope for the best! Separator image Posted in In Progress and tagged with exercise, knit, machine, tutorial. Hey Melissa, this is a very old post, I admit it, but I’m considering getting a binder for my coverstitch. A few questions: do you still like yours? Which size/fold pattern do you think is most useful? Have you learned any other tips? Thanks so much! I have the no-name binder off eBay and it works just find. I refused to pay $240 or it. I ordered the plate at $23, the binder attachment was $25, the short clear foot was $19 and $1.19 for longer screws for the base plate. The ones that came with plate were too short. So purchasing all under $74 was great! Then came the hard part — learning to use it. I watched Gail Yellon on YouTube. She has a video dedicated to using the binder attachment. It is important to keep the bias from hanging off the feed rack. One trick from another YouTuber was to wrap the bias around a toilet tissue tube, or paper towel tube, or make something similar. CD which generic attachment did you get? Sophie I purchased the plate and binder from seller ngosew and the clear short foot with removable metal center guide is Sew Link. Both on eBay. The plate and short foot are originals. What size binder do you have? Yeah that’s really common – I get that all the time too and it’s really frustrating! Even making sure the binder is fully tightened, it still slips around. Sometimes I find it’s actually more helpful to use my clear foot even though it’s longer, simply so I can see earlier when it’s trying to veer off course. But you’ve got to watch that sucker like a HAWK. I’ve heard other machines’ binders aren’t as bad, but I love my machine without the binder too much to ever think about switching. 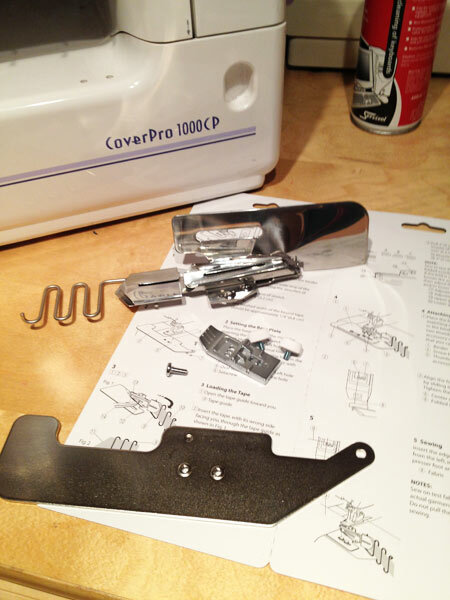 Hi Melissa – finally getting to use my CS and binder attachment. All is going OK but my neckline binding is too loose. When I attach the binding without the binder, I would slightly stretch the binding but the instructions say to allow the binding to run through without stretching. Should I be altering my pattern to make the neckline smaller or am I doing something wrong. Love your book although it has taken me ages to make the basic block so hoping to get a good fitted basic ready for the summer.